Ever wonder why during the following year in the garden the garden mums you purchased at your local nursery and planted in fall grow more leggy in your garden the following year rather than dense and compact as they were when you first bought them? There's a reason. Left to grow naturally in the garden, many varieties of garden mums become leggy by summer and will even start to produce flowers, which you don't want to let them do. Why? Because the flowers of garden mums will quickly fade and die in the heat of summer. This is because they prefer cooler temperatures and will hold their flowers for much, much longer during the cooler temperatures in fall. Mums sprout in early spring and then start to grow in a bush-like fashion, sometimes. However, depending on weather and the environment, if left un-pruned, as mentioned, some varieties will grow quite tall and leggy and start blooming way too early. When this happens the weight of the flowers and leaves on the stems will often cause the branches to fall over. To prevent this from happening and to maintain a compact shape with more branching, you can pinch mums back starting in early spring and continuing into mid-summer arounf the 4th of July. NOTE: You don't have to pinch or prune mums at all. If you choose not to prune you might only get a short bloom period in summer and it might be necessary to use plant supports to keep leggy stems from flopping over throughout the season. 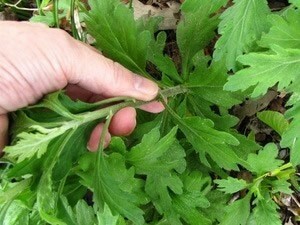 This pinching process may seem drastic, but the results will be bushy, well-shaped fall-flowering plants. NOTE: If it's already early summer and you have done no pruning, and your mums are tall and leggy, you can simply cut the plants about one-third to half way back. This should help to create a more dense plant that will bloom in fall. After your mums have finished blooming in the fall, and the foliage has gone completely dormant, you can cut the dead stems back to just above the ground. That being said, northern gardeners can leave the dead stems there to help protect the roots from severe cold weather during winter. No matter what region you garden in, it's a good idea to apply a 2-inch layer of pine straw or shredded wood mulch around the roots of your mums. If you place mulch directly on top of the plant make sure to remove it in late winter so that the new growth can emerge in spring without being damaged.